Home » Bathroom Help Category -- Also note those subcategories in the orange navigation, above! » bathroom tile help & ideas » Finding everything for a bathroom renovation in just 7 days: Can we do it? Finding everything for a bathroom renovation in just 7 days: Can we do it? I came to Kentucky two weeks ago to visit family, and about a week in, we decided to do a gut-renovation of Mom’s bathroom. The key goal was to replace the built-in tub with a walk-in shower. I’m of a certain age, so that means Mom is, too. It was time to add grab bars and make it easier for her to navigate her small, 1974 bathroom. In addition, the plumbing had been leaking and the tile was shot — the bathroom had completed its life’s work. My blog is not about preserving Everything. When it comes to many kitchens and bathrooms of past eras, if they have seen hard wear, were of dubious quality, or are just not functional for your needs any more: Give thanks for their long, loving embrace… and let them go. Mom was really excited about getting a new bathroom. She is the #1 fan of my blog and loves to tell me stories about growing up in Shenandoah, Pennsylvania… and then, as a young married in Southern California in the 1960s. Aside from some groovy original lighting fixtures in her 1974 house, there is not much else that screams “1970s” … and she didn’t want to do her bathroom in that mode anyway. Mom was decisive: She wanted a black-and-white bathroom reminiscent of her 1940s youth. Was this choice foreshadowed by the vintage hat we played with when we went antiquing in Louisville two summers ago? 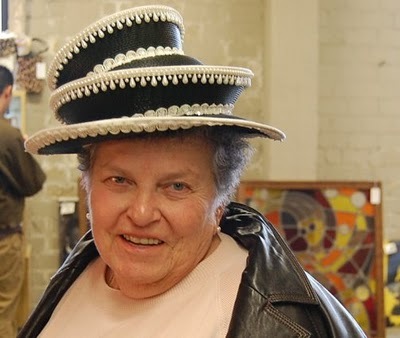 Mom in hat, above. Tee hee. I jumped at the chance to be her interior designer, and when I came back from Louisville Tile (thanks, Kirby and Travis) with American Olean 1″ hexagonal tile — white with black dot — paired with the 3″x6″ AO artic white subway tile, Mom was equally decisive in saying, “That’s exactly what I want.” I showed her 4″x4″ squares, too. But, she was gaga about the subway. Oh. Did I mention: Our goal was to gut and renovate the bathroom in 7-10 days, max. Since this was a spur of the moment project, we were faced with two significant, extra degrees of difficulty: (1) I could not ORDER anything that required more than a few days of delivery time. Everything had to be stock. And (2), We had to make decisions FAST. No gathering of 372 possible combinations of this and that agonized over, for weeks that turn into months. We had to decide Everything and get it into our hot little hands in like, 3 days. The AO tile shown above — was all in-stock. So this was our starting point. The hex tile would go on the floor and into the shower pan, with sanded grout. The subway tile, on the shower surround and walls. I will add, straight up: I would have preferred the Florida Tile subway tile, which was a bit creamier white. But we were concerned the delivery time required might have slowed us a day or two. Besides, I would have had to run to Louisville Tile to grab a sample just to Be Sure. So we said, “The Arctic is Just Fine.” The first agonizing decision averted, with only minor agony. This was a new experience for me. Now — the rest of the stuff. We needed: Trim tile to jazz up the subway tile… a vanity… a countertop… sink… toilet… storage cabinet… lavatory faucet… shower fixtures… shower shelves…. grab bars… towel and TP holder and robe hooks… lighting… exhaust fan… paint… grout color… window treatments… towels, rugs… art and accessories. I am a design blogger, I better make it look good. Gulp. Fortunately, my Aunt Mary Anne is a design whiz and spent about 30 hours of the 72 helping me reason through the choices. We had a blast. But, it was not easy to pull together everything so fast. This week, I will write about the 72-hour scavenger hunt through Elizabethtown, Kentucky, and online for Every Product required to coordinate and complete our 1940s-style Retro Renovation bathroom for my first and most important client ever: Mom. Then, the big reveal: The bathroom is supposed to be finished this Friday! I also used those same tiles for the floor and the subway tiles for the shower/tub walls, I found some georgeous ‘Sea-glass’ green glass tiles to add to the border in the shower and painted one wall the same light green but carried the black throughout with accessories. I was told at my tile store that that was a very outdated floor style and that I would hate it very soon, I am so glad to see that not only was he wrong but that there are many more people out here who love this besides me. The only thing I didn’t like about this floor tile was that it did not lend itself to adding a roll of radiant heating under it, but other than that I absolutely love it. Good job Pam, if anybody could do this in the time aloted its you. @Traci- when I went to the tile store, I was told the exact same thing! I love hex tile. My mom has a house she bought with a bathroom floor in yellow hex tile with green hex tile “flowers” (like clusters of six green tiles on yellow tile background) and she hates it – it’s old, you see – but I adore it. Now I want my “flowers” but in black and white! Damn! That looks really good. Welcome, Josie. We considered making some “flowers” but because of time constraints, I choked. 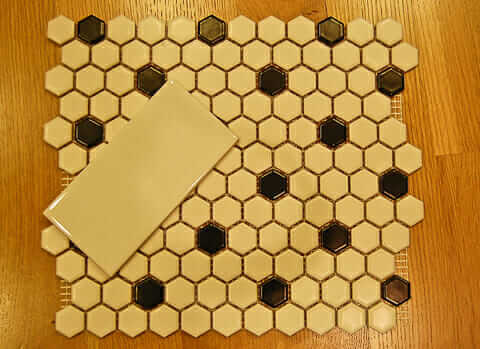 TOTALLY do-able with this tile: All you need are extra black hexes! You can also play around and make a “rug” in front of the vanity or wherever, out of the dark hexes. Your mom’s remodel sounds very much like the one that we are getting ready to do–I have more time than you and wondered how happy you are with your tile choices? Anything you would change? I’m getting ready to install this American Olean hex tile in my bathroom. I’m on the fence between using black or gray grout… any good reasons why I should not use black grout on the floors? I just think that gray is more timeless. I tend to think that black will show the dirt more than gray and also that using black grey is more “screamy” than using a concrete colored grout. But, it’s your bathroom — do what makes you happy! Thanks for the input, Pam. As my tile guy put it, “black grout shows light dirt and light grout shows dark dirt”, and so gray does seem like the best option. I may compromise and do a dark charcoal gray. I love contrast, sharp lines and a bit of drama… somehow gray seems so “natural” to me– I may punch things up a bit. Also… what is the standard grout color for bathroom wall tile? I know you could use pretty much whatever you want, but most photos on your website look like white wall tile grout, correct? I am not an expert on “what’s standard” but yes, I think white. A tile guy told me once there is a brite white and an old fashioned white grout.